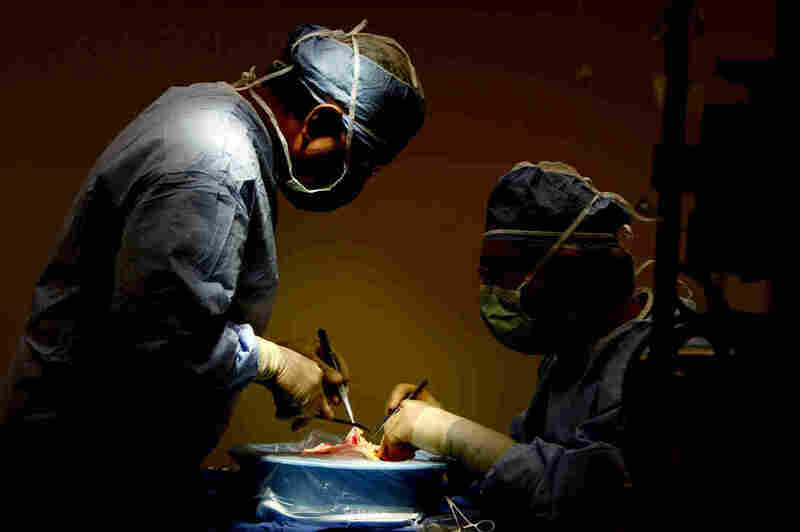 Who Gets First Dibs On Transplanted Liver? Rules May Change : Shots - Health News Location, location, location too often trumps medical need, some doctors say. But another solution to making the distribution of scarce organs fairer worries some transplant surgeons and patients. Vicki Hornbuckle used to play the piano at her church. But that was before her liver started failing. "I had to give it up because I couldn't keep up," says Hornbuckle, 54, of Snellville, Georgia. "I didn't have the energy to do three services on Sunday. You're just too tired to deal with anything. And so, it's not a life that you want to live." Either it's a jackpot and you have very, very easy access to a lifesaving liver — if you lived in Indiana or if you lived in Louisiana or Florida. But if you live in California or New York or New England the chances are significantly worse. But Hornbuckle hasn't given up. She's fighting to stay alive long enough to get a liver transplant. "I would like to see my grandchildren grow up," she says. Plus, she adds, her mother is still alive, and "it's not fair to have to bury your children. It's not supposed to work that way." About 900 miles north, in East Hartford, Connecticut, Woody Wright is also on the transplant list. He's 38 and used to work as a pharmacy technician — until his failing liver made him too sick. "I do I feel horrible," Wright says. "Some of my bones are hurting really bad. I'm anxious ... waiting and just waiting for this liver." Hornbuckle and Wright are among more than 12,000 Americans waiting for a liver transplant because their own is failing, because of conditions such as hepatitis, cancer or cirrhosis. But only about 6,000 livers are donated each year. So, each year, hundreds of patients like Hornbuckle and Wright die while waiting. And not everyone has the same chance to get a liver. It depends a lot on where you live. "Either it's a jackpot and you have very, very easy access to a lifesaving liver — if you lived in Indiana or if you lived in Louisiana or Florida," says Dr. David Mulligan, a transplant surgeon at Yale University. "But if you live in California or New York or New England the chances are significantly worse." That's because the country is divided into 11 regions and some regions have more livers for transplant than others. "So in the Southeast, for example, or in parts of the Midwest, where there's a higher death rate," Mulligan says, "there are more donor organs." I'm worried about dying before I get my new liver. Any time you have to wait behind somebody else and your life depends on it ... you worry. And the sickest patients in each region get the first crack at every liver, which means patients in the parts of the country that have the most livers don't have to be as sick to get a transplant as people who live in other places. "We have this huge disparity," Mulligan says. He chairs a committee assembled by the United Network for Organ Sharing, which manages the nation's organ transplant system, to come up with some ideas for making the system fairer. One possibility would be to divide the country into much bigger districts — perhaps only eight or even four. That way that livers could be distributed across a much wider area, making the chances of getting one about the same no matter where you live. "Our goal is to save lives and to be fair, and to take this scarce resource and to spread it in a way that will allow us to save lives," Mulligan says. But the proposal is raising a lot of concerns. Some patients in regions that currently have the most livers to offer would have to wait longer to get a transplant than they do now. That's because more organs from their area would end up going to sicker patients in other regions. "The impact on patients in our area would be that it would increase their likelihood of dying while waiting for a liver transplant," says Dr. Marty Sellers, a transplant surgeon at the Piedmont Hospital in Atlanta. Sellers and others argue that a better solution is to get more people to donate livers in places that need them. "We don't have enough livers here in Georgia to transplant all the patients that are in need here," Sellers say. And some worry the change could end up backfiring by making people less willing to donate organs. Many people say they donate because they want to help someone in their community, transplant teams say. "People who live in Texas would prefer for their organs to be transplanted into people who live in Texas rather than to go to New York or Chicago," says Dr. Michael Charlton at the Intermountain Medical Center in Utah. "People feel like that." People who favor changing the system agree that more needs to be done to increase donations. But that takes time. And they dispute the idea that rejiggering priorities would end up costing lives. "There are patients that are currently receiving liver transplants that could easily wait a little longer so that patients who don't have the option to live can live," Mulligan says. When you ask patients about this, how they feel tends to depend on where they live. "I don't think it's fair how they're doing it right now," says Woody Wright in Connecticut. "You should not take it all for yourself. Share it around," he urges. "Let it be fair. There are a lot of sick people out there." But Vicki Hornbuckle in Georgia isn't convinced. "I'm worried about dying before I get my new liver," she says. "Any time you have to wait behind somebody else and your life depends on it ... you worry." UNOS is holding a public hearing in Chicago on Sept. 16 to discuss how best to distribute the limited supply of livers for transplantation.